Inspire your cancelled and lapsed members to join again! You already have their contact information, so it’s easy to stay in touch. Remind them of the good times they had while visiting your club and the benefits they received. Chances are all they need is a little motivation to get back on track and back to your club! 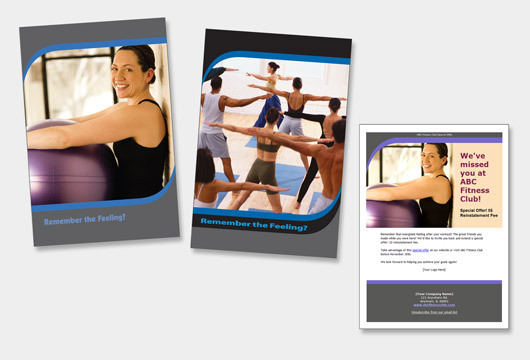 All designs Copyright © 2007–2008 VCP Printing, Inc.
Order what you need: Select a whole campaign or individual items from any campaign. Included with standard pricing: All items can be customized with your logo, your club information (including name, mailing address, phone numbers, web and email addresses), colors representing your club or brand, and if desired, your own photos in place of the design photos. Other design changes may require additional fees. Learn more on our How To Order page. Interested in this campaign, or any item from this campaign? Ordering is Easy! Call us at (847) 658-5090 or use our VCP Contact Form.